For lots of people, summer fun includes Wiffle Balls. This season the plastic balls are 50 years old, so The Saturday Early Show's Ira Joe Fisher traveled to an unassuming brick factory in Shelton, Connecticut, to meet the a family that makes them. "This is what the Wiffle Ball is formed from," said Wiffle Ball's vice president David Mullany. "It's called polyethylene." David can tell you almost everything about his product, but he's careful about divulging certain information such as the number of Wiffle Balls made each day. "The guy in the office would have my head [if I told]," he said. "It's a family secret." The "guy in the office" is David's dad, also named David, who is the company's president. A half-century ago, his father - another David - invented the hard-to-aim piece of plastic. Ira Joe asked David how the Wiffle Ball works. "I'm told that science can't even explain why the Wiffle Ball does what it does, is that true?" David's answer: "I don't know what science says but I know that I have no clue and I don't really care because it works, so what the hell's the difference?" 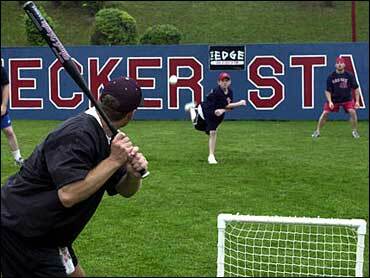 Playing Wiffle Ball doesn't require a big field or many people to play. All that's needed is a bat and a ball and a little bit of space to make your own field of dreams. The Chrzanowski family of Wallingford, Connecticut, has been playing on their own field of dreams for 25 years. In fact, Frank Chrzanowski says they purchased their home mainly for the big backyard. "When I bought this house, it was all empty fields," said Wiffle Ball player Frank Chrzanowski. "We decided to make a Wiffle Ball field back here, knowing I had one son at the time and for the future." Frank is officially retired and has turned his bat over to his youngest son Jason, who shares his dad's dedication to the game. "It brings my family together," said Jason. "It brings my friends together, [so] we can all play." Perhaps it's the togetherness that Wiffle Ball seems to inspire, that has kept the Mullany family's company flying high for 50 years. "What [would] your grandfather think if he were still around?" Ira Joe asked the younger David Mullany. "I think he'd get the biggest kick out of it," David answered. "We're still cranking them out, keeping busy, and you know we just pay attention to making a really good product."